Dr. Rebecca Hobbs routinely recommends dental implant restorations for replacement of missing teeth and stabilization of complete and partial dentures. A dental implant is a titanium cylinder that is inserted in the location of a missing tooth to serve as a foundation for a dental restoration such as a crown, bridge or denture. Dental implants are placed by implant specialists (oral surgeons, periodontists or general dentists with advanced training in dental implant surgery). 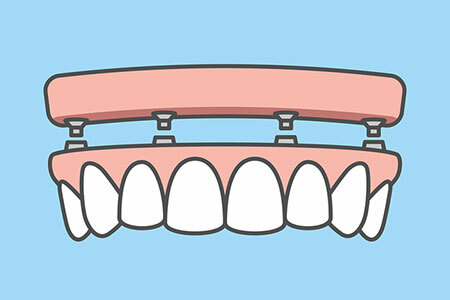 Following initial placement, dental implants are allowed to heal and integrate with the jaw bone. The implant specialist may support the dental implant with bone or tissue grafts to promote healing and stability. After the proper healing time, Dr. Hobbs transforms the dental implant(s) into a functional tooth replacement. A single implant is typically restored with a crown; multiple implants may be restored with a dental bridge or a partial or complete denture. All-on-four or all-on-six dental implant procedures refer to placement of 4 or 6 implants in a single arch to provide support for a removable denture or a fixed arch appliance. Dental implants offer a wide range of treatment options to bring your smile back to healthy function. If you are missing teeth and have difficulty chewing or if you are embarrassed by the gap in your smile, dental implants may be a good option for you. The first step to restoring your smile is to schedule a complete dental examination and consultation with Augusta restorative and cosmetic dentist Dr. Rebecca Hobbs. Dr. Hobbs will take a close look at your specific needs and talk with you to learn about your goals. The Hobbs Dentistry Team is ready to help you Smile. We believe every patient deserves a healthy smile! Our team will help with researching your dental insurance coverage and review scheduling and financial options with you to support your treatment plan. Dental implant solutions are more comfortable and affordable than ever before. We invite you to Contact Hobbs Dentistry today to schedule your dental implant consultation. It would be our pleasure to assist you!